Huawei is a Chinese multinational telecommunications equipment and services company headquartered in Guangdong, China. Founded in 1987, the company originally focused on manufacturing phone switches, but has expanded its operations to building telecommunications networks and manufacturing communications devices. 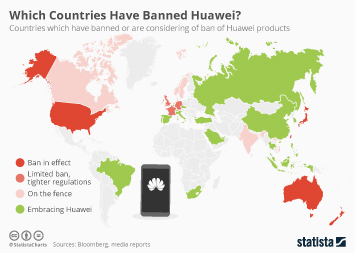 Huawei works with some of the world’s largest telecoms operators, counting British Telecom (BT), Vodafone, Orange, and T-Mobile among its notable partners. This continued success has made the company the most valuable telecom infrastructure brand worldwide with an estimated brand value of more than 38 billion U.S. dollars. Huawei’s revenue has consistently increased since 2007, and has reached the highest figure to date in 2017. The company is split into three core business segments – carrier network business, enterprise business, and consumer business. Its carrier network business is the company’s most lucrative segment, with the consumer business sector being the second most profitable one. Although Huawei has developed into a global company, a large proportion of its revenue is still generated in its domestic market. As of 2017, Europe, the Middle East, and Africa are the second largest and most important markets for the company. Huawei is the largest network service provider in the world, accounting for about 30 percent of the global market share. Huawei is also the leading manufacturer of VoIP and IMS equipment with about 26 percent of the global market. Ericsson and Nokia are the company’s closest competitor in both markets. The company is also one of the main players in the telecom equipment and ethernet switch market. Although Huawei supplies many white-label products for other content-service providers, it also produces and sells a variety of devices under its own name. As of the fourth quarter of 2017, the company held a share of around 10 percent of the global smartphone market, selling more than 150 million smartphones in 2017 .